Living in San Diego for over 3 years now, I recently got to experience my first ride on the trolley! When I plan on brunchin’ and drinkin’, I usually just grab an Uber, but $30 roundtrip Ubers start to add up! A $5 day pass to ride the trolley to your hearts content can save you 6 times the amount! Whether you want to head inland, or come into the city from the east, there are so many amazing options to eat and drink along the trolley route for a fun, inexpensive and safe day of brunchin’! On a recent foodie trolley tour with some fellow local SD foodies, we stopped at three different restaurants along the trolley route. Wood Ranch in Mission Valley, Farmer’s Table in La Mesa, and The Smoking Gun downtown. All three restaurants are conveniently located within walking distance from the station. First up, we boarded the trolley at the Santa Fe Depot Station on our way to Wood Ranch. Much like I spoke about Wood Ranch in my previous blog, as soon as you step off the trolley the aroma of wood smoking lures you through the front doors. Wood Ranch doesn’t officially serve brunch, but their unbelievable Smokin’ Mary is available all day every day! I still think about that balsamic marinated jalapeño to this day! I love, love, love the farmhouse salad, but make sure to start off with their tri-tip sliders and sip on the refreshing Havana’s Best Mojito. For our second stop we made our way to Farmer’s Table in La Mesa. A favorite, and named one of my best bloody marys in San Diego, Farmer’s Table is home to the Barnyard Mary. Featured by Food Network, this gargantuan is topped with a whole roasted chicken! But looming in the shadows of this Food Network Star is delicious farm-to-fork brunch fair! From artisan pizzas, to a variety of Benedicts, omelets and frittatas with eggs fresh from Ramona, to Reese and tiramisu sweet dishes, you can responsibly enjoy your locally sourced breakfast. The other foodies and I were blown away by all the menu offerings. We couldn’t believe we still had another stop left! 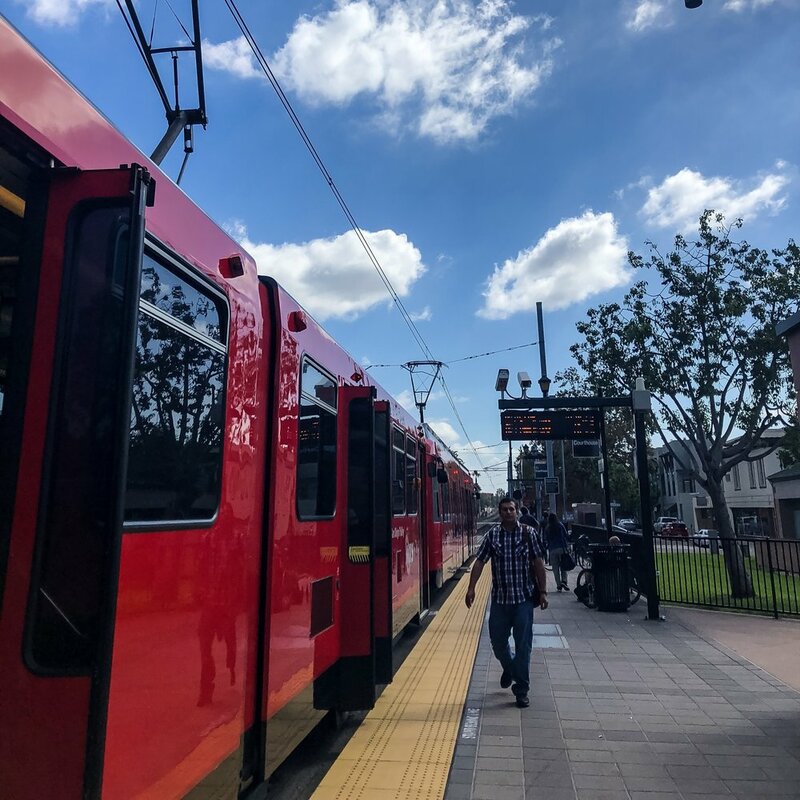 Being incredibly stuffed from the first two stops, it was a nice, quiet and relaxing ride from La Mesa to downtown on the trolley. Once we hopped off the trolley downtown we had a short walk to The Smoking Gun, which also helped burn some of those calories off! As always, don’t brunch and drive! Be safe and save money by riding the trolley for $5.00!!! I’ve given you three bomb spots you can easily access from the trolley stations: Wood Ranch, Farmer’s Table, and The Smoking Gun! 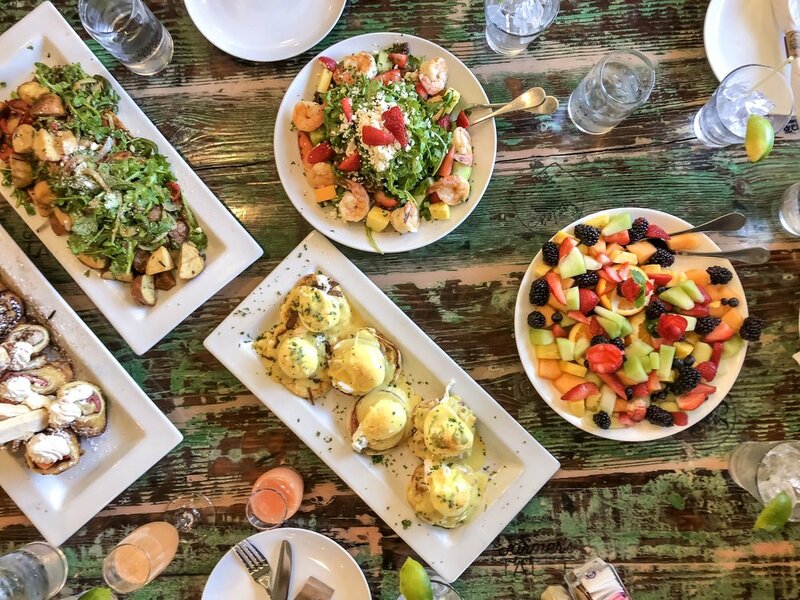 Whether you want to head inland, or come into the city from the east, there are so many amazing options to eat and drink along the trolley route for a fun, inexpensive and safe day of brunchin’!